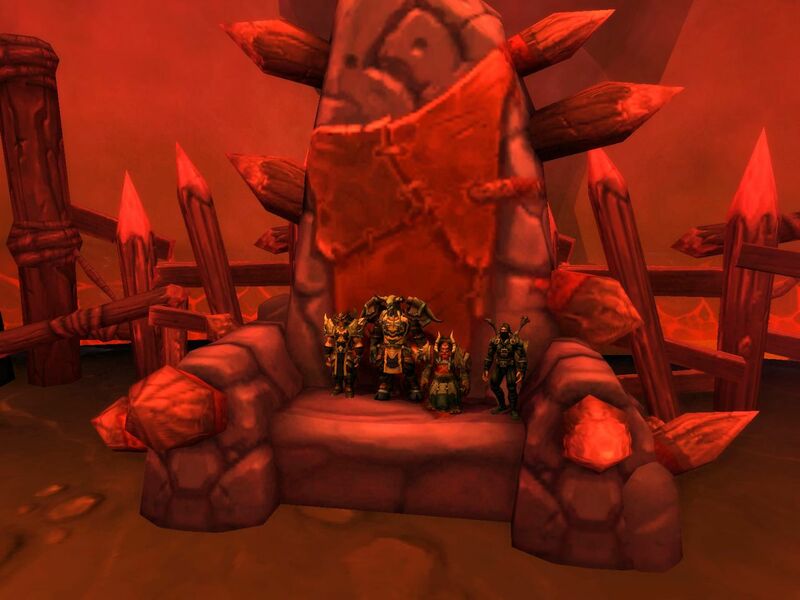 As a welcome to the new year, this past Saturday saw the full instance group reunited once again in Azeroth. While we have all been in the Warlords of Draenor expansion at the same time on at least on occasion, that was less than a coordinated group effort. We were just getting through the intro and into our garrisons and sort of laying the groundwork for things. This time we were all online and ready to join together and do something as a group. Ula was able to join us, but not having been around for the last couple of forays, was behind the curve when it came to levels, being not too far into 91. As for what to do, that seemed a pretty easy choice. 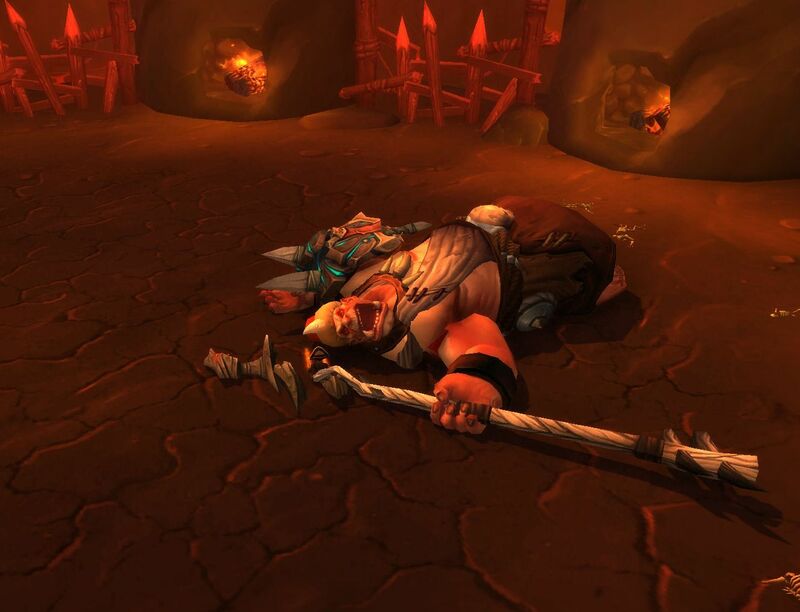 We were going to go back to the Bloodmaul Slag Mines. 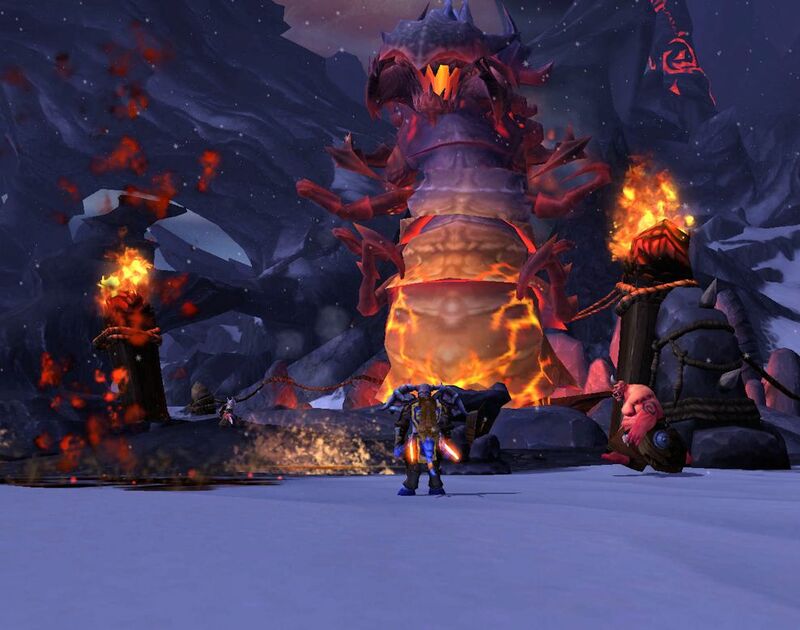 This entry was posted in entertainment, Instance Group, World of Warcraft and tagged Bloodmaul Slag Mines, Frostfire Ridge, Gorgrond, The Iron Docks, Warlords of Draenor on January 15, 2015 by Wilhelm Arcturus. It was not a full group. Ula was not feeling well. But we thought we ought to scout the path to the first instance, in keeping with our standing policy of not using the Dungeon Finder to enter them. 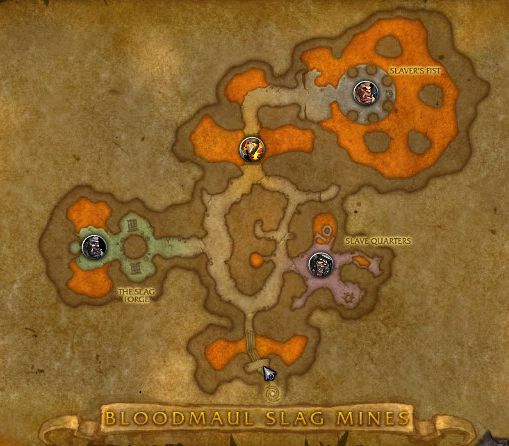 The first five person dungeon instance in Warlords of Draenor is the Bloodmaul Slag Mines, which is all the way over in the Frostfire Ridge zone, where the horde starts out after exiting Tanaan Jungle. Frostfire Ridge is quite a ways away from the comfort of garrisons in Shadowmoon Valley. Fortunately, on hitting 92, we all got the starter quest for the Gorgrond, which includes a flight out to the zone from your garrison. That at least put us in a zone adjacent to Frostfire Ridge. Earl had already been deep into Frostfire with other characters, while Skronk and I had gone at least far enough in with other characters to get the first flight point in order to be able to do the fishing daily for the zone. So we had an idea of how we were going to get there, a general route. 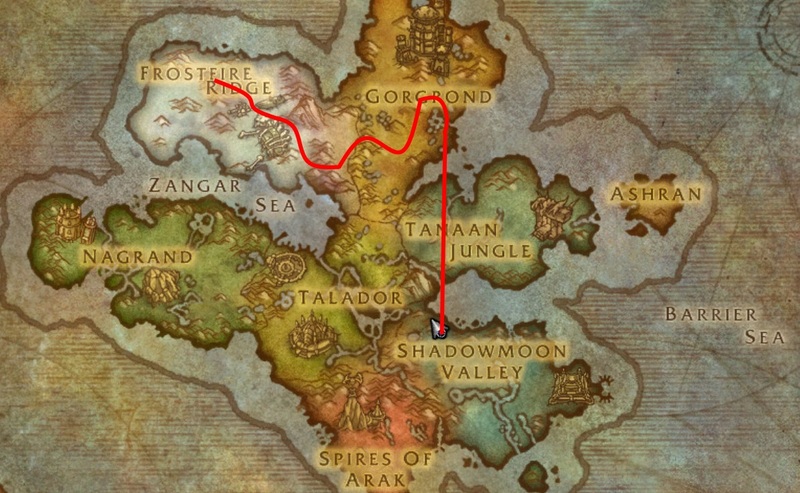 Just take the flight to Gorgrond and then follow the road to its closest point to Frostfire, then cut across, making our way through a pass and into the snows. 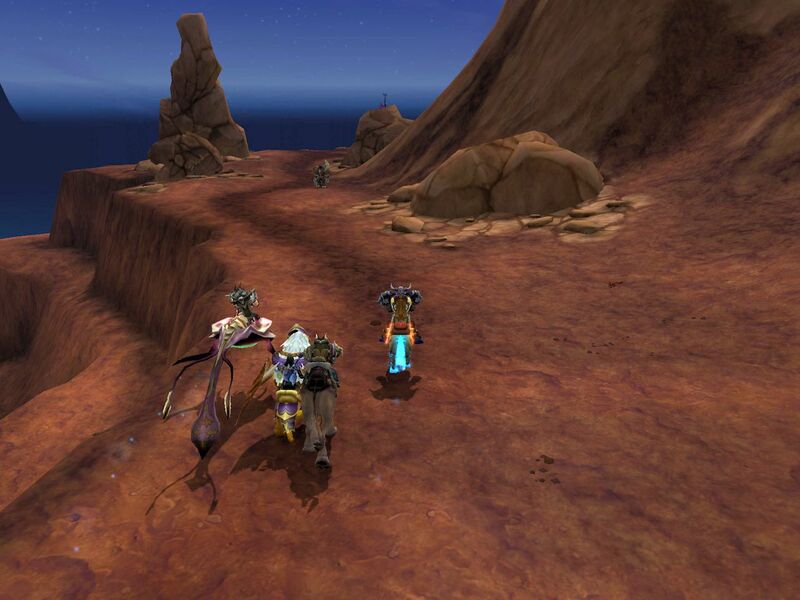 We met up at the flight point in Gorgrond and off we went. We have been on cross-continental travel adventures before. Earl had actually gone into Gorgrond already, following the quest line up to the point of building his lumber camp outpost in the zone. The rest of us were setting foot in the zone for the first time, so I was curious to see if we would have any phasing issues as we went. When we reached the point just before the outpost location, we could still see Earl, but it was clear that he saw different terrain than we did. For him there was a clear path up to the plateau where his outpost lay. For us, there was a series of large boulders blocking the path. You could go around the boulders easy enough or, if you like a jumping puzzle, you could actually climb up through them. So phasing seems to have been upgraded a bit. Unlike the days back in Wrath of the Lich King, people didn’t just disappear from the world as you entered an area that was different for each, though there is still the potential for comedy in “Go up the path!” “What path, it is just boulders!” I suppose. We carried on past the outpost location, heading for Frostfire, stopping to kill the occasional silver border mob and, once, getting ourselves splattered all over the scenery by an open world heroic mob. 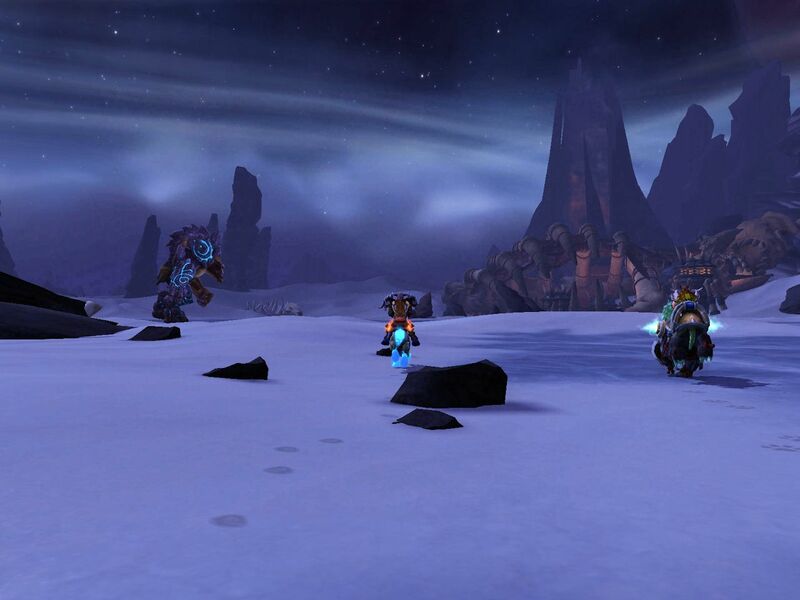 We rode across the zone, zig-zagging and trying to find a gap into Frostfire. I was pretty sure I knew a route that would work, but there were a couple of potential paths along the way that we had to check in on. They were dead ends, but did lead to at least one more silver border mob kill. We pressed on, eventually finding the way through to Frostfire, dashing through a hostile village, and emerging near the Iron Siegeworks, where there are lakes to fish in and an alliance friendly flight point. From there it was a ramble out of the mountains and into the Cracking Plains. We did stop to pick up a couple more special mobs along the way. 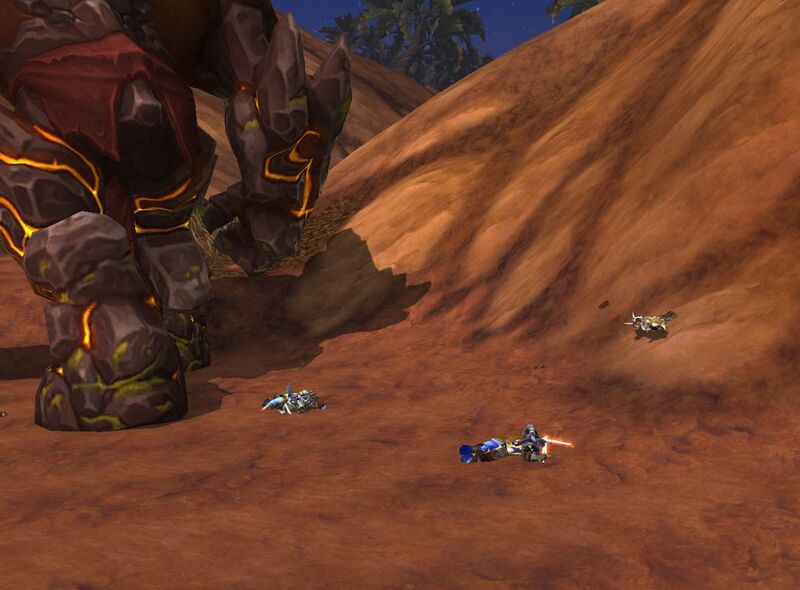 We eventually found the flight point, summoning stone, and entrance to the Bloodmaul Slag Mines and were soon inside. As for what we found… it wasn’t a completely linear dungeon. We chose to turn right at the first intersection and cleared as we went around the circle. Given that this is a five person instance and we were not exactly beyond the level gap and only a four person group, the whole thing seemed pretty… easy I guess. Granted, Earl is superman, and he has that Garrosh heirloom sword that ensures he not only tanks, but also tops the DPS list. However Skronk was coming into to healing for real for the first time since the 6.0 changes, so I thought we might have a hiccup or two. But we seemed to plow on without fuss until we hit the final boss. 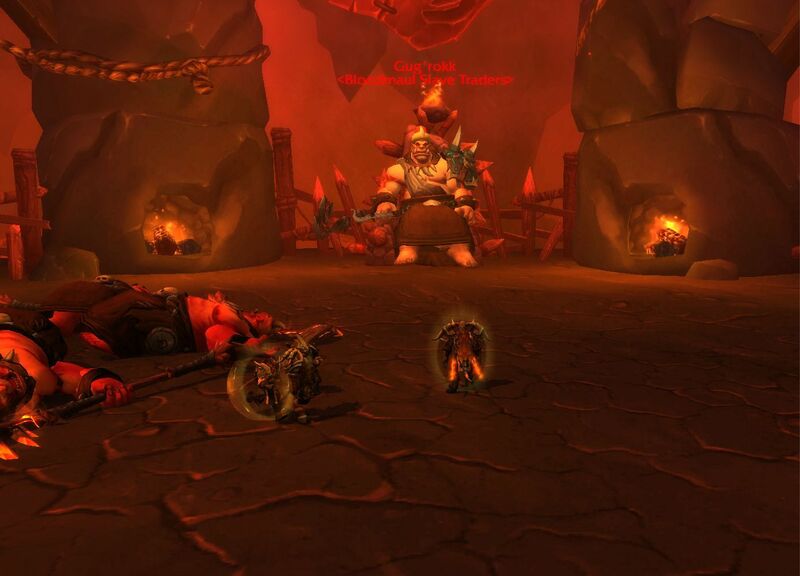 Gur’gokk did give us a little trouble, though it was less about him being tough and more about us learning the mechanics of the fight and simply stepping out of the fire at the right time. He lays down all sorts of molten harm you have to avoid, and we failed on that front the first time through. However, we regrouped and ran back. Armed with what we learned… which was we needed to kite Gur’gokk around a bit so we could stay out of the molten gunk… we were able to defeat him handily on the second try. That got us the achievement and earned us some gold for the guild bank. We took out usual post-instance group picture. Then there was a question about what to do next. Travel and the instance took up a decent chunk of time, but we still had a bit more in us, so we decided to run to the next instance just to scout it out. So off we went to the Iron Docks, which was back on the upper west coast of Gorgrond. 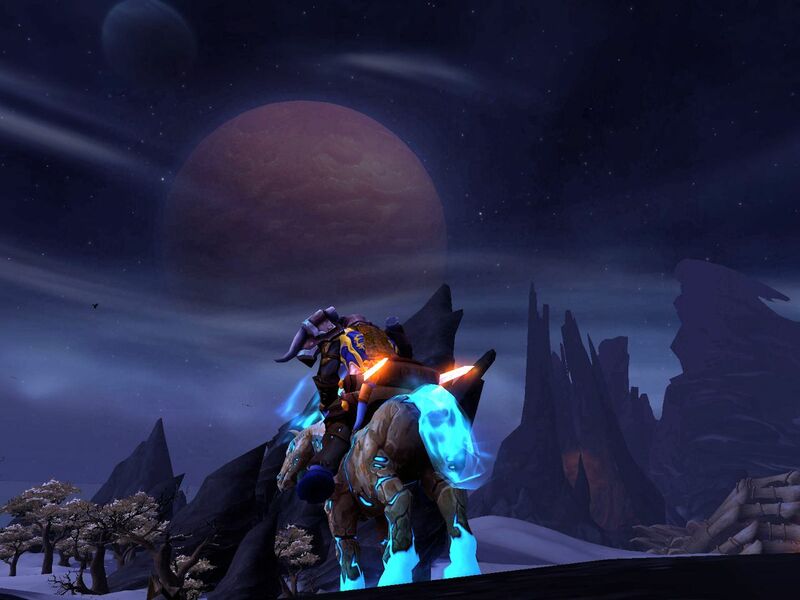 We had to ride, because we did not have a connecting flight point between the Iron Siegeworks and Gorgrond. So off we went on another set of minor adventures. At one point I got completely separated from the group, but manged to rejoin them. Then we tried to sneak up along the cliff, only to fall in the ocean. At that point the Death Knight skill frost path became pretty handy. We were a bit worried about how we were going to get back up to the land, as the coast was mostly cliffs. However Blizzard left us a path up from the beach just south or the Iron Docks. 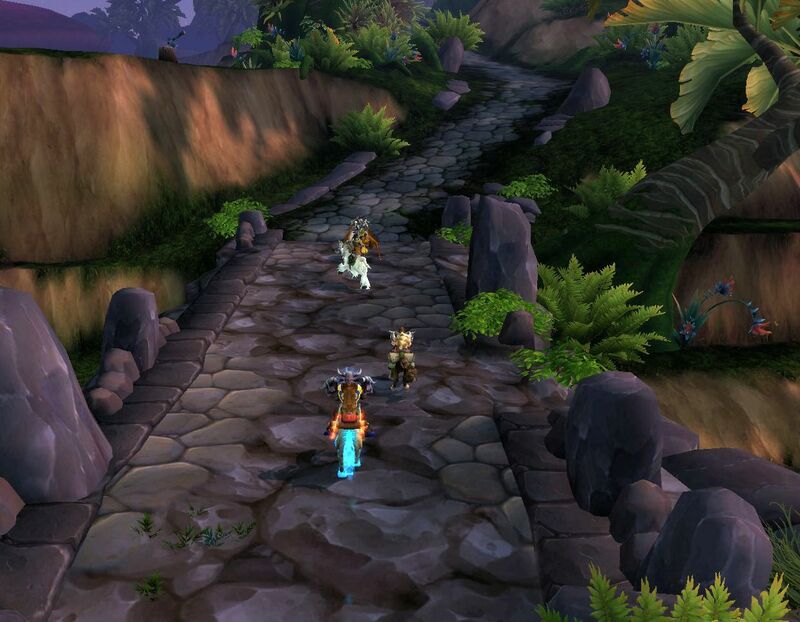 We got in, got the flight point… which also connect the flight paths from Frostfire Ridge to the rest of the world for us… poked our noses around, got chased by a pile of mobs we accidentally aggroed, ran into the instance to shake them, then called it a night. And so ended the last adventure of the instance group in 2014. 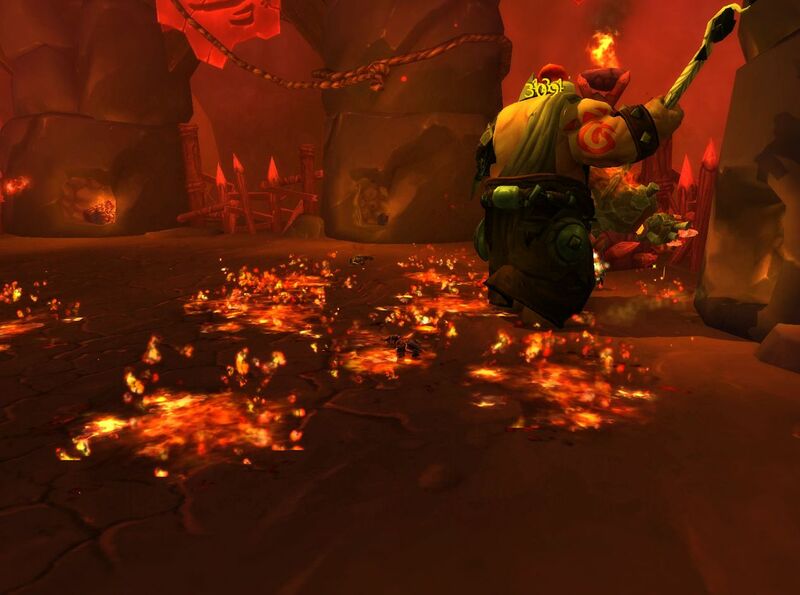 We will have to get Ula on when she feels better and go back to the Bloodmaul Slag Mines so she gets the achievement as well. I am also considering trading out my Death Knight. I have a hunter in the right level range, I wouldn’t mind a change from melee DPS, and if I brought him we would have somebody who wore mail armor, thus covering all of the bases, cloth, leather, mail, and plate. We will see how I feel in 2015. This entry was posted in entertainment, Instance Group, World of Warcraft and tagged Bloodmaul Slag Mines, Frostfire Ridge, Gorgrond, Iron Docks, Warlords of Draenor on December 30, 2014 by Wilhelm Arcturus.